Times are always tough for someone, and Bruce Springsteen, as durable a lighthouse in rock as has ever existed, is always there to address the struggle and provide reassurance. And when belts are tightened, a "waste not, want not" mentality is adopted. It's this intent behind High Hopes, an album made up of years of outtakes, covers, and live Boss staples refashioned and shined up. This is a refurbished muscle car of sorts, with lightning stripes on the sides slapped on by guitar alchemist/fellow Woody Guthrie and social justice enthusiast Tom Morello. And it's a mostly thrilling and memorable ride, but it can also break down once in awhile. Two shrill guitar notes are sent out like distress flares at the outset the title track, a cry for help that sums up the thesis statement of the record, as well as the thought behind this widescreen folk rave-up that is the strongest work here. "High Hopes" is a cover from Tim Scott McConnell of the now-defunct Los Angeles-based act The Havalinas, and it's a welcome development that the time-constrained Springsteen is loosening up his controlling tendencies and featuring works by others on a studio album; there are three tunes by outsiders here, including Aussie punk band The Saints' "Just Like Fire Would" and Suicide's meditative "Dream Baby Dream." Leaning on others is key to hope, and it's also something that happens all over Springsteen's 18th studio release. In a "young man, help me across the street"-type way, the 64-year-old is leaning at practically a 45-degree angle on fretboard pyrotechnician Morello (Rage Against the Machine, The Nightwatchman), featured on no less than eight of the 12 tracks here. It's a good thing that Morello is a mercenary creative force and confident enough to hang with the Boss. He torches, he scorches, he mimics vinyl scratching, he scuffs and squeals, and is given so much leeway in the volcanic, devastating poverty tale "The Ghost of Tom Joad" that Springsteen lets him sing half the verses (to the unsurprising chagrin of some Bruce purists). No matter; this is a torrid bromance forged in the mud of humanism. Elsewhere, Springsteen lightens the mood, churning out out some let-out-the-slack, "Come on STEVE!" party rock with "Frankie Fell in Love," which could not exist without the shared history and harmonies of his longtime blood brother, mugging TV star/E Streeter Steven Van Zandt. The number is a direct descendant of "Ramrod" and they'd pair exceedingly well together live, just as Bruce and Steve do. 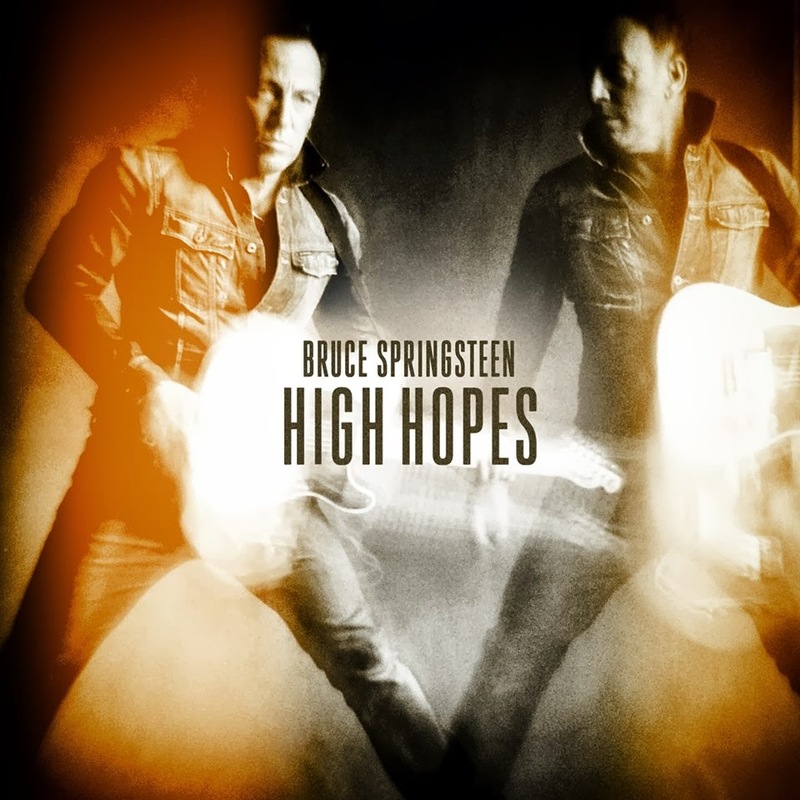 High Hopes demonstrates that Springsteen can still surprise in this late career hour. The pulsating criminal tale "Harry's Place" is a noirish gambit that would have been a terrific theme song to "The Sopranos." Furthermore, it's as Leonard Cohen-esque in lyrics and vibe as Springsteen has ever gotten. Speak-singing like it was a lost track from Cohen's coolly apocalyptic 1993 album The Future, the Boss rasps jaded-wisdom lines like "You need a little shot of something to improve your health/A taste of that one little weakness you allow yourself." But alas, if only all the material was up to the level of "High Hopes" and "Harry's Place." Buried deep in the middle lies "This is Your Sword," which, for all its encouraging intentions, comes off trite and fit for a singalong children's album, or even better, relegated to a second edition of Bruce's song clearinghouse anthology Tracks. The larger disappointment here is "American Skin (41 Shots)" which fails not in its content but in its execution on record. A condemning, quiet song written in response to New York City police shooting Amadou Diallo in 1999, and finding modern relevance with the Trayvon Martin case, this contemplation of injustice suffers because it's backwards engineered. Debuted live in 2000 and brought out again this past year on the Springsteen concert stage, it breathes best in the live moment, charged with immediacy and distinguished by the experience of others hearing it alongside of you. 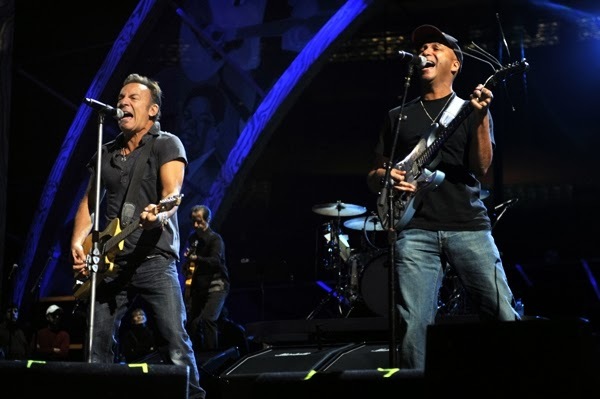 In interviews for this album, Springsteen has said he wanted certain unrecorded live songs to have more authority by being on an official album, but the opposite has occurred; "American Skin (41 Shots)" needn't have been polished and formalized in this way, as a well-produced recent live version of it would have sufficed and been authoritative enough. Springsteen has deliberated about "selling that which can't be bought" in regards to his booming concert business and what brings people back night after night; it's unfortunate he didn't think through that same ethos in this instance. Past emotions are vibrant and real, but they resist being distilled for longevity. Springsteen's missteps seem to be forgivable overall, particularly when he drops an evocative work like "Hunter of Invisible Game," a weary, cinematic ballad referencing "empty cities," "burning plains," and "empires of dust." Through it all, his voice is resolute. High hopes, for him, spring eternal.